Mention the term 'Soviet architecture' and instantly enormous concrete buildings come to mind. The term 'Brutalist', from the French 'beton brut' (raw concrete), flourished in the 1950s -1970s, inspired by the works of Le Corbusier and Ludwig Mies van der Rohe. As an architectural style it was also associated with social, utopian ideology. After the devastating Tashkent earthquake of 1966, many large-scale apartment blocks were quickly built to house the homeless. Later, several grand buildings were constructed as well as the marvellous metro system. 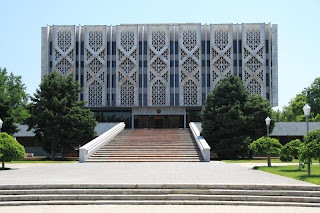 The massive Hotel Uzbekistan, centrally located at Amir Timur square, Tashkent, is a classic example of Soviet 1970's modernist architectural style. In its heyday celebrities such as Federico Fellini, Marcello Mastroianni and Raj Kapoor stayed there, as well as the power brokers of the USSR. Influenced by the Soviet space program and Yuri Gagarin's celebrated journey into outer space, Soviet architecture also took on ideas of the cosmos and science fiction. 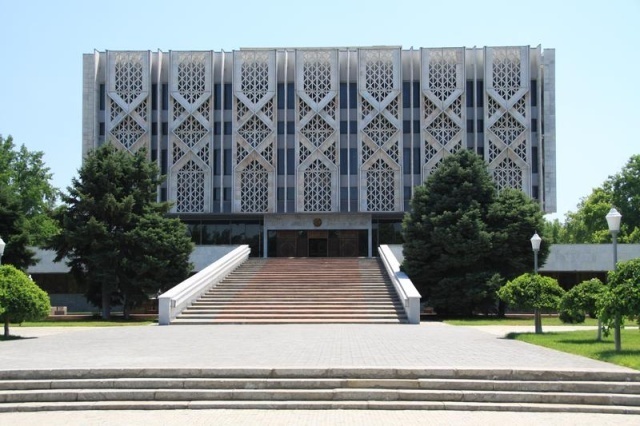 One such building in Tashkent is the former Lenin Museum, which now houses the vast State Museum of History of Uzbekistan. Earlier this year Taschen published Frédéric Chaubin's book CCCP:Cosmic Communist Constructions Photographed. Chaubin, editor of the very cool French lifestyle magazine Citizen K, documented 90 buildings, constructed from the 1970s through to 1990, that dominate the urban landscapes of 14 former Soviet republics. It's a fascinating record of daring, imaginative, even eccentric structures. 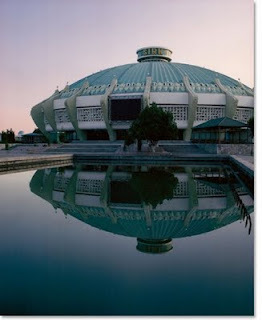 As Chaubin comments in the introduction: "The key to Soviet architecture is above all political. The causes of its evolution are to be sought not in architectural theory but, more prosaically, in the regime and its evolution. Nowhere else and nowhere over such a long period of time has the urban landscape been so directly shaped by power”. View a video clip interview with Chaubin (3:30 mins).